This powerful and thought-provoking documentary captures the charisma of the crusading priest while it explores the tensions between the Catholic Church and its African-American flock. 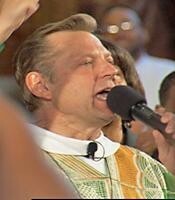 Mike Pfleger almost defines the word iconoclast: He is a white priest in a nearly all-black parish; an outspoken maverick in a rigidly conservative archdiocese; a preacher whose sermons are more akin in style and tone to Black Baptist traditions than to White Catholic. He has repeatedly challenged orthodoxy — from his adoption of three boys to his frequent political activism — making him a constant irritant to the Church hierarchy. Yet Pfleger has also transformed a dying parish into one of the city’s most vibrant, while leading the economic revival of one of Chicago’s most impoverished neighborhoods. Radical Disciple relates the remarkable story of this Catholic rebel and in so doing examines such broader contemporary issues as the frayed relationship between the Church and the African-American community, the power and importance of the mass media in shaping people’s perceptions, and the tension between the social consciousness of Pfleger’s “gospel of the streets” and traditional notions of religious “neutrality” in political issues. The film investigates the early influences that motivated Pfleger to devote his life to fighting racism and injustice, especially his shock at witnessing the bitter protest against Martin Luther King, Jr., in Chicago’s Marquette Park in 1966, and shows how he has learned to “use” the media in a sophisticated way to spread awareness of his message. It also documents how Pfleger’s larger-than-life personality sometimes becomes a story in itself and obscures the larger issues he is addressing, such as with his notorious rant against Hillary Clinton during the 2008 Presidential contest. Commentators and critics who appear in the film include Rev. Jesse Jackson, Catholic activists Tom Roeser and Mary Anne Hackett, journalist Carol Marin, Univ. of Chicago theologian Dwight Hopkins, and Chicago religion writer Tim Unsworth. Radical Disciple and its charismatic subject will engage students and inspire thought and discussion is a wide variety of courses in sociology and social issues, American studies, ethnic studies, communication and the media, and religious studies. It was produced by Bob Hercules.